Two long-time Princeton nonprofits--the Friends of Princeton Open Space and the Whole Earth Center--are collaborating to sponsor monthly workshops for those interested in growing native plants. The first session—I want to call it the “kickoff” session but football analogies don’t quite go with native plant gardening—took place in the Whole Earth Center café on Sunday, February 25. A full house of 20 participants shared their interest and ideas. Grow local genotypes of native wildflowers and shrubs from locally collected seeds and cuttings. Visit local remnant native plant communities that can serve as models for backyard gardens. Help participants learn to identify plants and their preferred sun and water levels, and gain confidence in identifying weeds. Show how to put rainwater runoff to use in the garden. All of the activities will seek to connect gardeners and gardens to the broader landscape of Princeton—its nature preserves and the ecological forces at work there. One of the most disruptive forces in local preserves are the invasive exotic species--the same species that invade backyards and serve as the default landscape in untended areas. 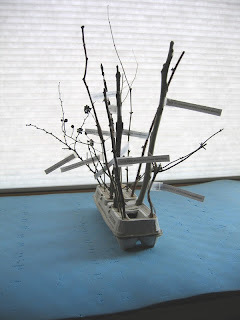 As part of the first workshop, I brought in a newly fashioned model of the typical understory of a local preserve. Though most trees in Princeton are native, the understory is a motley crew of mostly exotic shrubs that can easily be identified in winter by various traits such as thorns, twig color, and opposite or alternate branching. This high-tech photo of the equally high-tech model shows the pirate ship of invasives sailing the troubled ecological seas of Princeton’s greenspace. A sequel to this posting will feature an ark of native species, currently besieged by the exotic legions but whose tide could turn with the help of some human intervention. Princeton is now hosting a long-awaited Winter in Residence program. Though scheduled to begin back in December, programming did not get underway until February, due to the increasingly temperamental behavior of the guest artist in recent years. Last year, Winter stormed out of Princeton for most of January, in what now seems a mild rebellion compared to this year's long-delayed appearance. There's no doubt that Winter has been struggling in recent years. Its greatest masterworks--the glaciers and the polar ice caps--have been washing into the sea. Its whimsical craftings of frost on windows are few and far between. Even Winter's riffs on snowflakes, billions at a time and no two the same, are less common and quickly sullied by traffic. It's understandable that Winter would be ever more reclusive--embarrassed by its dwindling powers, angry and depressed at the pellmell destruction of its greatest works, weakened from breathing too much CO2. In its place, for months at a time, has been a season without a name, neither spring nor fall, comfortable yet discomforting--a void, an end with no consequent beginning, as if we were living within a season's empty shell. 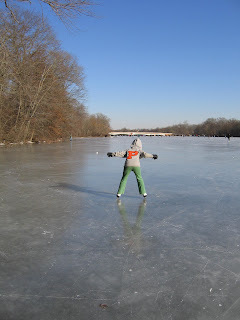 All this was for the time-being forgotten, though, when the arctic air blew in and Winter, quietly working in its favorite and most deceptively magical medium, transformed a pretty but otherwise cold and unwelcoming lake into a dancefloor, public square and sports arena. 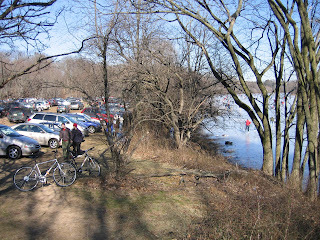 Working without a budget or publicity, nor any tools beyond serendipity and physics, Winter drew thousands of local residents to a spontaneous community festival down at Carnegie Lake. 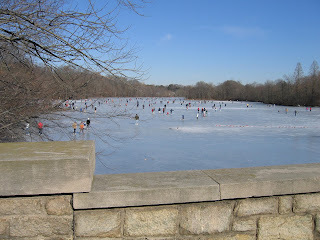 Rows of cars filled the field; skaters of all abilities plied the wondrously smooth ice. One skater propelled himself with a homemade sail. A baby took to the ice in a baby carriage. Along with some pickup hockey games, there was a slippery, slidey game of soccer played slow-motion in boots. Word had it that the last time such magic was worked on the lake was twelve years ago. We all savored the experience, not knowing when it might happen again.